You know the old expression about getting the cart before the horse? Well, I think that’s what happened when I recently wrote my post about how reluctant Lot was to leave Sodom. In spite of all the evil that surrounded him there and the coming destruction of the city, he lingered. However, if we back up a few chapters in our Bible, we get a better feel for how Lot made decisions. I think that makes his hesitation a lot clearer. You likely remember that Abram’s and Lot’s herdmen were arguing about the lack of land for their animals to graze on. Here was Abram’s solution. It’s decision time for Lot. Does he pray about which way to go? It’s not recorded that he did. Here’s what we do know. Wow – like the Garden of Eden! Having just been to the Grand Canyon, I know what it feels like to be moved by the beauty of a great view. And seeing all that fertile land must have looked like hitting the jackpot if you want your flocks of animals to prosper. Then we read this in Genesis 13:12-13. When we first read about Lot’s decision, we see what looks good in the here and now. What we don’t see right away is the end of the story. We couldn’t necessarily predict how Lot’s decision would affect his life, and the life of his entire family. If we could know in Genesis 13 how the sad and sordid story would play out in Genesis 19, we certainly would have warned Lot. We’d ask him to reconsider his decision. What about Abram, left with what must have looked like the inferior option. Was he discouraged when he saw what he was left with? I don’t know. But isn’t God faithful, in the very next verses, to remind Abram of the promise He’d made to him? In spite of what the world might think – perhaps that he got the raw end of the deal – God knew the end of the story. He knew that Abram would be blessed. So how do you and I make our decisions? Are we tempted to be like Lot and take the option that looks like it will benefit us the most right now? The Bible says that the wisdom of the world is “foolishness with God.” (I Corinthians 3:19) We have to think past the now, the present, to where this may potentially lead us and our families. Our choice has to be based on more than what looks good today. Our decisions impact our children. We can’t see the end of the story from where we are currently, but God can. I think we know where to start. Prayer. It’s back to James 1:5, and asking for the wisdom God promises to give. Then get wise counsel. Those who’ve been doing life for a longer time and in a Godly manner may be able to see ahead in ways that we can’t. When we’re wrapped up in a difficult situation, we can lose perspective. I have to wonder if Lot’s story would have had a different ending had he asked Abram’s advice on what to do. 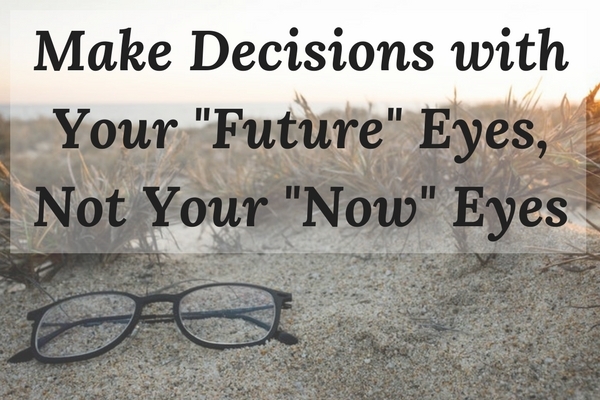 Finally, let’s make decisions using our “future” eyes instead of our “now” eyes. What seems to be the easiest or most obvious choice to make today may not be the best decision in the long run. Think through how your decision could play out, both positively and negatively. As we seek God’s will, may our story end like Abram’s did in this chapter – resting in God’s promises, and with a heart ready to worship Him. Yes! It is so easy to make decisions on what feels good and looks good now without taking into account how that decision will look in the future. Even “little” things like snapping at my husband: it feels good now, but it’s very harmful for our future. Thanks for this reminder! We too often respond to the emotions and/or pressure of the moment, especially when the decision feels like it must be made NOW. How wise of our Lord to tell us to wait upon Him. So much heartache could be avoided if we wait and pray as you point out here. Thank you for the reminder, Tracey!